Ahoy, Vintage pinup Sailor girl ~~ This is a must have summer vintage sailor inspired trousers by Banned Apparel. 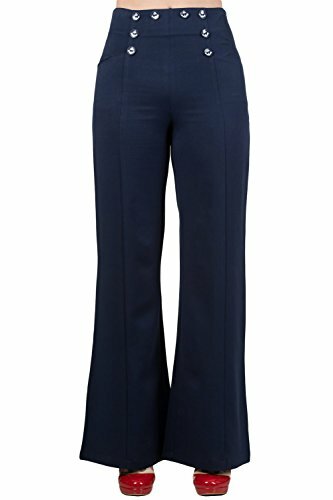 Made of superb quality light weight cotton blend materials, wide leg bell bottoms style, decorative Anchor buttons on front, and functional side pockets. Side Zipper & hook closure. These pants give you the perfect nautical sailor look and you can pair these pants with a pair of red high heels and you are good to go! Size: Banned Apparel UK sizing. Please see the sizing chart Below. If you have any questions about this product by Banned Apparel, contact us by completing and submitting the form below. If you are looking for a specif part number, please include it with your message.